Auschwitz was the largest camp established by the Germans. It was a complex of camps, including a concentration, extermination, and forced-labor camp. It was located at the town of Oswiecim near the prewar German-Polish border in Eastern Upper Silesia, an area annexed to Germany in 1939. Auschwitz I was the main camp and the first camp established at Oswiecim. Auschwitz II (Birkenau) was the killing center at Auschwitz. Trains arrived at Auschwitz-Birkenau almost daily with transports of Jews from virtually every German-occupied country of Europe. 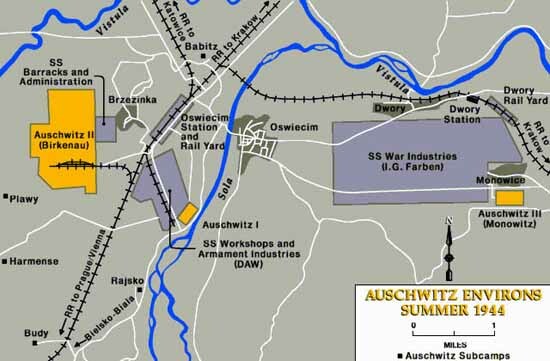 Auschwitz III, also called Buna or Monowitz, was established in Monowice to provide forced laborers for nearby factories, including the I.G. Farben works. At least 1.1 million Jews were killed in Auschwitz. Other victims included between 70,000 and 75,000 Poles, 21,000 Roma, and about 15,000 Soviet prisoners of war.